aka What Star Are You From? I had enjoyed actor Kim Rae Won in his early 2000's romantic films ...ing (2003) with Su Jeong Im, and My Little Bride (2004) with Geun Young Moon, and my friend Alison had really loved him in the K-drama Love Story At Harvard (2004) with Kim Tae Hee, but then quite awhile passed before I saw him in anything again. A few years ago I watched him in 2011's A Thousand Days' Promise with Soo Ae which was so depressing I could barely get through it, and then in early 2015 I saw him in the film Gangnam Blues (2014) with Lee Min Ho, and barely recognized him (neither could I stand the insanely violent movie!). He apparently has had troubles with alcohol and the law since those early years when he was so cute and a promising leading man, and all the stress shows in his face now. In ten years he has aged twenty. I found myself missing the younger version of himself when he was the sweet and romantic type, and so I decided to plunge into another oldie, 2006's What Planet Are You From? which was quite a success in its day, averaging between 12% and 15% ratings in Korea. The first episodes did have a lot of sweetness and charm, and showed a sad tragedy that helped Kim Rae Won's character become very sympathetic right at the beginning of the story. The leading lady Jung Ryo Won (My Lovely Sam Soon) also did a very good job in what was essentially a dual role of sisters separated in their youth, one dies tragically, and then the grieving family of the deceased sister see her doppelganger on the street and suspect immediately she is their long lost daughter. The show is enjoyable, but it's quite dated as K-dramas go, and has a lot of older cliches that people are tired of seeing in K-dramas now, so it will take a special person to give it a chance today. It has a very nice music score, which also helps. And for me, an additional incentive to watch was that one of my personal heartthrobs, actor Park Shi Hoo (Cheongdamdong Alice and The Princess' Man), had an early role here playing second male lead. Once again I found myself with a strong second male lead syndrome where I kind of hoped against hope that the leading lady would end up with him! The Story: Filmmaker and director Seung-hee Choi (Kim Rae Won) has made a name for himself making documentaries, music videos, and independent films. On a business trip to Australia life changes overnight for him when he falls deeply in love at first sight during a cocktail party with a beautiful young lady named Hye-soo Lee (Jung Ryeo Won). She is an aspiring musician whom his best friend Jeong-hoon Han (Park Shi Hoo) brings with him to the party, telling Seung-hee that they've known each other since childhood and are good friends. Seung-hee is introduced to her and there are immediate sparks flying between them. After hanging out together shopping and sight-seeing in Australia for several days, Seung-hee and Hye-soo plan to get married, which surprises and saddens Jeong-hoon since it's obvious he cares for her too; it also displeases Hye-soo's austere wealthy mother Jin Hee (Lee Bo Hee) who thinks Seung-hee isn't good enough for her daughter. However, it's too late for objections -- they're head over heels in love and Seung-hee wasted no time in buying a ring and proposing marriage; he gives the ring to her spontaneously and playfully as they drive on a highway to go to a restaurant for dinner. 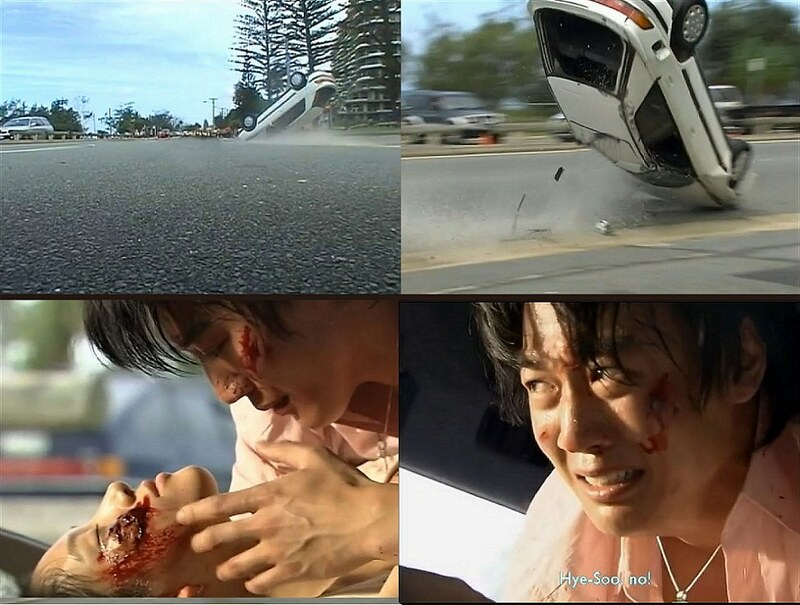 As he happily puts the ring on her finger, Seung-hee suddenly careens wildly on the road to get out the way of a truck. The terrible accident causes Hye-soo's death. Grief-stricken and filled with guilt, Seung-hee then returns to Korea and spends the next three years in seclusion, miserably drinking himself sick, and holing himself up in his apartment, forgetting all about his art, friends, and family. He keeps videos of Hye-soo constantly playing on his TV. This guy needs help before he destroys himself! Jeong-hoon his friend has taken over the film company and urges Seung-hee to finish his grieving process and to start working on films again. "Enough! You're killing yourself, it's time to move on!". Seung-hee pulls all his energy together to push Hye-soo out of his thoughts once and for all. On the day he finally decides to go out of his apartment and to continue working again, he sees a young woman at the sidewalk who looks exactly like his beloved Hye-soo. Struck dumb by the utter similarity of the two women, he starts to follow the girl to her hometown, which turns out to be a far-flung country province called Gangwon. The girl, named Bok-shil Kim (also played by Jung Ryeo Won), realizes this man following her has nowhere else to stay for the night and offers her home as an "inn". Being poor, she considers all opportunities a chance to get good money and tells him that the room he rents will cost him twenty dollars, a fortune to her. Bok-shil's sickly mother Soon Ok (Im Ye-jin) who lives with her is a bit threatened by this male presence and the effects he might have on her too-trusting country bred daughter, but the money changes her mind. After spending the night at their ramshackle home, Seung-hee spends the morning together with Bok-shil searching for fresh mountain water and he encounters a wild boar in the forest, which frightens him in a comical scene. Seung-hee does not at first reveal his identity or profession to Bok-shil, and she mistakes him for a poor bum waiting to pass a long overdue civil service exam. While walking in the countryside and on the lovely hills, Seung-hee is inspired by the beauty of his surroundings and gets ready to prepare for his next film, using this country place as his setting. He then returns to Seoul and later comes back to Bok-shil's village to shoot his movie. They see each other again, and Bok-shil realizes Seung-hee is a renowned director. Bok-shil then positions herself as a rice-server for the crew and comes to the set everyday. By a stroke of luck, Jeong-hoon, also on the set, notices the resemblance of Bok-shil to the dead Hye-soo and offers Bok-shil a job at the film company back in Seoul. Bok-shil tells her sick mother she will go to earn a nice salary and return in a month with money for her for a needed surgery. Bok-shil starts work in Seoul as an assistant for Seung-hee but her awkward and clumsy country bumpkin persona ends up being more of a hindrance than a help to the company, and some employees start to resent her being there. However Bok-shil braves the demands and criticisms of her work admirably, and seems to grow in confidence little by little. Seung-hee finds himself being attracted to Bok-shil because of her similar physical appearance to the dead Hye-soo and then later on because of her own unique charms and humor and sweet disposition. Does a man fall in love with a certain physical type alone, or does personality and character mean more to him in the long run? The drama examines this question in some unique and interesting ways. Hye-soo's family, by chance, sees Bok-shil on the street and the mother realizes she is the long lost sister of Hye-soo. Hye-soo's mother, determined not to lose another daughter, runs an investigation to find out Bok-shil's real identity. Proving that Bok-shil is really her lost daughter Hye-rim, the mother pleads with Bok-shil / Hye-rim to leave her rural life and adoptive mother to embrace her true lineage with her rich biological family. But can Bok-shil really totally abandon the mother who raised her and who needs her so desperately as she ages and becomes more vulnerable? Through Mi-hyeon Yoon (Kang Jeong-hwa), the film company's music director, who turns out to be her cousin, Bok-shil realizes she is really the sister of Hye-soo, Seung-hee's deceased fiance. She is now conflicted on how to tell the truth of her identity to Seung-hee, who has fallen in love with her in earnest. How can someone fall in love with the man who was responsible for the death of her sister? Bok-shil struggles and sees no easy answer which will please everyone. After the initial shock and confusion of learning the truth, Seung-hee is able to overcome his fears and he admits he is in love with Hye-rim / Bok-shil. Bok-shil's biological mother, pained yet again for her surviving daughter's boyfriend choice -- the same man whom she considers to have killed her other daughter -- becomes determined to put an end to the relationship between them and forbids them to marry. Her hate for Seung-hee has come full-circle, just at the time he now has the chance to do what he wasn't able to do for poor Hye-soo, bring happiness to someone in earnest. Will the biological mother ever relent and allow her surviving daughter to marry this man who is such an anathema to her? Can forgiveness ever enter a heart made hard by grief? The last two episodes provide the answers and it's a roller coaster of different emotions for the audience. I liked this old-fashioned love story: the acting is excellent in leads and supporting cast, and it poses interesting questions about redemption and moving on emotionally from tragedies and losses. It is old-fashioned in style, like I mentioned earlier, but some viewers don't mind that older style of drama making, whereas others would dismiss it out of hand. I'd say try it though and make up your own mind. Everyone's tastes are different. About the only thing I would have changed in the story was the physical appearance of the "country bumpkin" Bok-shil. I can understand how in the beginning when she was poor that her clothes and hairstyle were rather awful, but as she matures and is accepted by her rich biological family the makeup people should have shown her developing a different style, a bit more sophisticated, but they never do. Most of the time they keep these ugly Pippi Longstocking braid jug handles as her primary hairstyle and it drove me crazy. I would yell at the screen, "You're in your twenties, girl, please stop dressing like you're 12 years old!" LOL. That's my own little idiosyncrasy, however; you might find her childlike persona refreshing.